Round 8 of the Invictus World Championship moves to Japan for the Japanese Grand Prix. 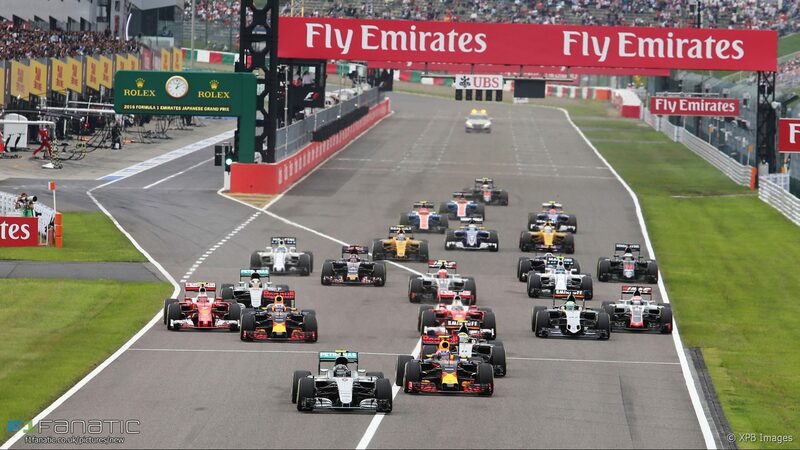 The Japanese Grand Prix is a race in the calendar of the FIA Formula One World Championship. Historically, Japan has been one of the last races of the season, and as such the Japanese Grand Prix has been the venue for many title-deciding races, with 13 World Champions being crowned over the 30 World Championship Japanese Grands Prix that have been hosted. The first two Formula One Japanese Grands Prix in 1976 and 1977 were held at the Fuji Speedway, before Japan was taken off the calendar. It returned in 1987 at Suzuka, which hosted the Grand Prix exclusively for 20 years and gained a reputation as one of the most challenging F1 circuits. In 1994 and 1995, Japan also hosted the Pacific Grand Prix at the TI Circuit, making Japan one of only seven countries to host more than one Grand Prix in the same season (the others being Great Britain, France, Spain, Germany, Italy and the USA). In 2007 the Grand Prix moved back to the newly redesigned Fuji Speedway. After a second race at Fuji in 2008, the race returned to Suzuka in 2009, as part of an alternating agreement between the owners of Fuji Speedway and Suzuka Circuit, perennial rivals Toyota and Honda. However, in July 2009, Toyota announced it would not host the race at Fuji Speedway in 2010 and beyond due to a downturn in the global economy,and so the Japanese Grand Prix was held at Suzuka instead. Suzuka has hosted the Japanese Grand Prix every year since 2009. What are your thoughts on Brazil last race? are you looking forward to the new 2017? Last race, I crashed with Unomi on lap 8 so another DNF. Such a pity though, I was enjoying it. Drivers title, I'm going for Spud but it could be any one of Spud, Craig, LK or Mike. I like to wish them all the best of luck in Japan. I hope their race goes well. Reall don't want to predict, because weather and other factors may play a huge role. more worse race looks like But it happens, that's racing. the game looks very promising. 5th last season and anything better I take it happily. Whoever wins it it will be deserving. Pole - Jamiemet has a cracking chance in the Ferrari. Race Winner - Can't see anyone winning it apart from Cliffy - the guy has fantastic pace. I did enjoy the challenging and changing conditions, also had a good battle with TamLad and Cliffy. But I'll admit I was very fortunate at the start of the race; gaining a handful of positions due to incidents occurring between other drivers. Hopefully tonight we can get through Turn 1 without incident. Yes. After testing the Beta it looks like it could be a cracking game. What makes it more exciting is we have a cracking bunch of people involved and becoming involved with Invictus; a group of people I trust going wheel to wheel with and that's certainly rare. I am excited for the growth in our site and the continued excellent racing we've had so far. Keep up the great work everyone. Who will win the drivers title? Sirspud, Craig, LK0299, xMikexSI? This is definitely a hard one to answer. Spud has a good lead going into tonight's race and LKO has been in good for as well as Mike. The Williams will give LKO and Spud good straight-line speed, but Mike will be formidable in Sector 1 with the RB. I personally think Spud has it. It's his to lose.